Like Brisbane's other inner-city suburbs, the Paddington area had quite a few hotels in close proximity to each other. 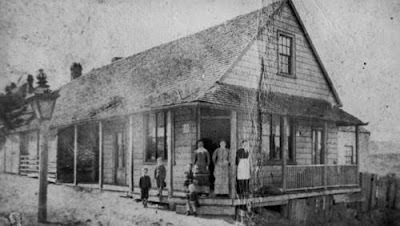 We saw the Normanby Hotel in a previous post, and today we are looking at another hotel with a long history. Situated on the corner of Petrie Terrace and Caxton St, the Hotel LA (as it is now known) probably started its existence as the Terrace hotel around 1864, but in 1868 it was renamed the Prince Alfred as a result of the visit of Queen Victoria's son Alfred, the Duke of Edinburgh, in that year. The Brisbane History Group's publication, Sites of Separation, reckons that at that time the hotel was a simple rectangular structure that probably looked like its neighbour, the Cricketers Arms Hotel, pictured below. 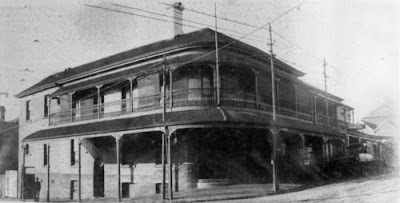 The Cricketer's Arms stood on the nearby corner of Cricket St and Petrie Terrace, but no longer exists - the building on the site today is a Freemason's Hall. The Prince Alfred Hotel was rebuilt around 1887-8 for the Queensland icon, Castlemaine Brewery, the makers of XXXX beer, and this is the way it looked in 1929. This historical area of Brisbane became very unkempt and unloved for a period of years in the sixties and seventies. The old police barracks across the street and this hotel were very rundown indeed. The Prince Alfred lost its chimneys and verandahs, its cast iron balustrading and the awnings. In the late 1980s, the hotel was refurbished and renamed the Hotel LA (Lord Alfred), and the developers took care to restore it to its former appearance. It now appeals to the inner-city gentry and the football revellers who attend big matches at Suncorp Stadium just down the road. Its cellars and alleged underground tunnels to the former prison/police barracks opposite give it a certain street-cred in some quarters. I have always heard of hotel LA from my team mates who takes a visit in Paddington. They use to describe its beautiful design that will absolutely make one go back. I'm just glad to finally see the current and even the previous photo of the Hotel. This seems to be a good model for my exhibit. In would be glad to use a portable CMM for this. Thanks again for sharing! The lie of the land suggests that the Cricketers' Arms hotel was on the site of the present Christadelphian Church building, rather than the Freemasons' building?